A front stoop, set of stairs or even a porch can settle. In fact, of all the issues we see in foundation settlement, front stoops/stairs and porches rank in the top 3 (along with chimneys leaning and garage column settlement). 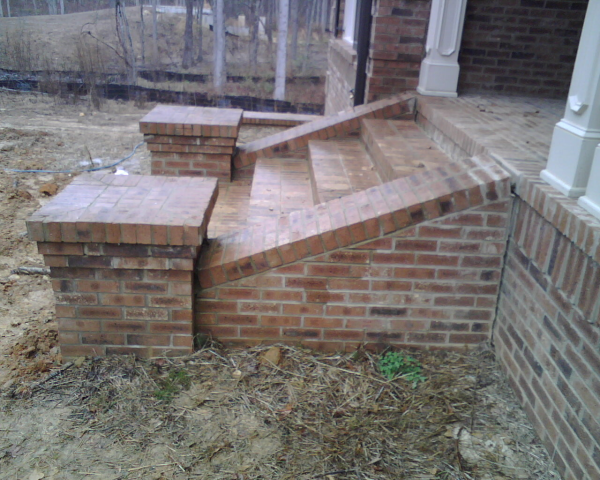 Stoop or stair settlement is a common foundation problem. Front stoops, stairs and porches are typically built on the front of homes within the first few feet of the foundation. When a house has a basement, or has a deep crawlspace, the soils on the front of the home are disturbed during construction. When a builder pours the foundation walls, he then pushes the soil back against his new wall. In both a block or concrete poured wall, the builder has to be careful not to apply too much lateral pressure on the exterior while back filling for fear of “blowing” the wall in or causing damage. For this reason, the soils typically are poorly compacted or only slightly compacted. What does this mean? Uncompacted or poorly compacted soils are a major reason for foundation settlement. In this case, the porch, stoop or stairs are placed on this soil. As the soil consolidates (compacts over time), the stoop will settle as well. In many cases, a stoop will be removed and rebuilt only to settle again as the new stoop is sitting on top of the same poorly compacted soils (or worse, the builder of the new stoop poured concrete thinking he would go deep enough to stop future settlement). We discussed the dangers of pouring concrete in another blog here. Front Porch PiersOne solution for failing stoops and stairs is to install a helical pier to support the front porch. These helical piers will penetrate through the fill material and into dense soil, allowing adequate support. These piers can offer stabilization or, in most cases, lifting of the stoop/stairs. As with any foundation repair, the conditions will vary and need to be examined by a competent person before determining the method of repair.